Good morning! It's time for a new challenge at Cardz 4 Guyz, and this week's challenge is Whatever the Weather. 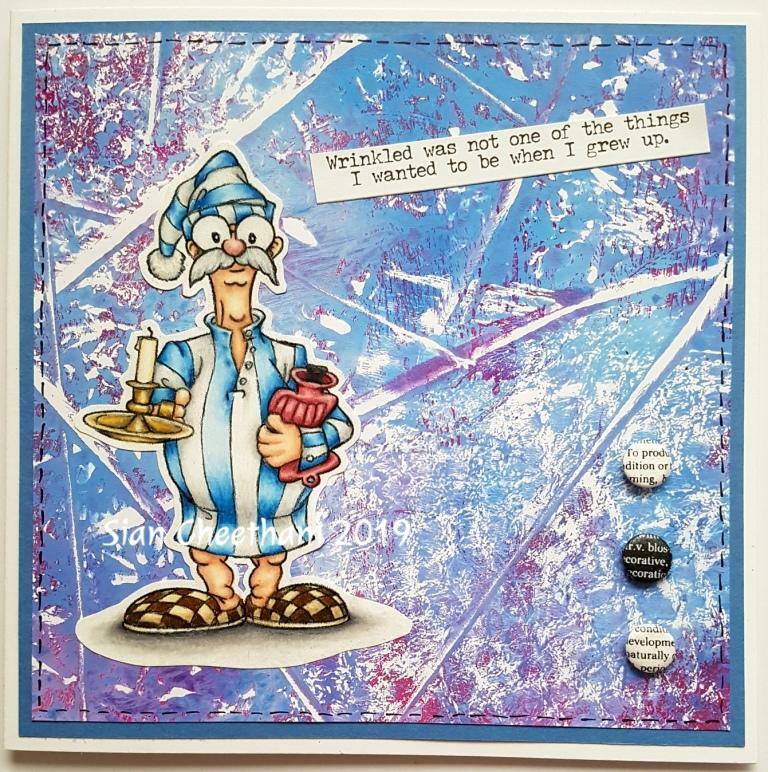 I didn't have many weather things in my stash that were suitable for a male card, so I decided to go with snow (even though it's April!) It gives me a chance to carry on trying to get a head start with my Christmas cards anyway. 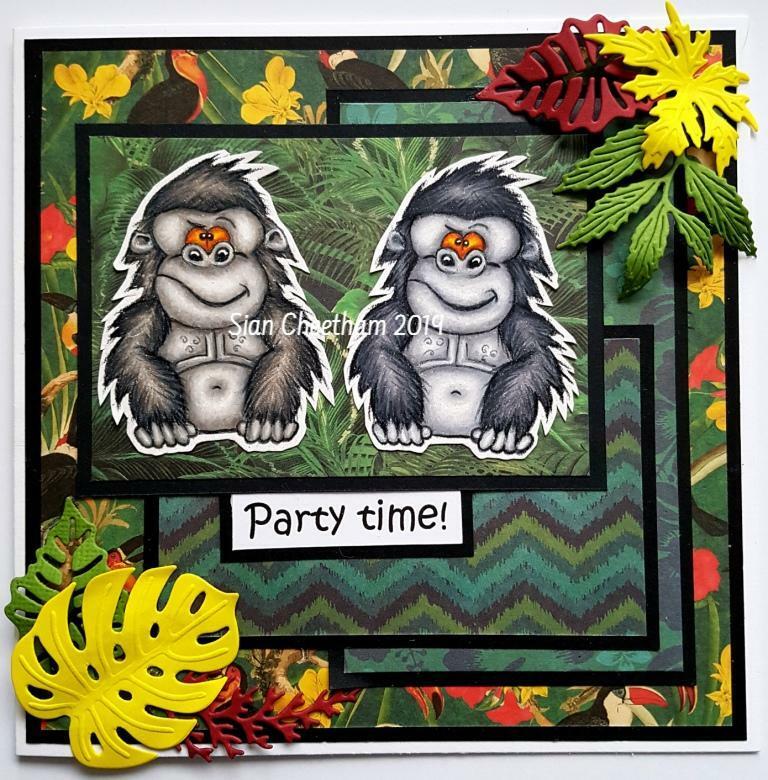 The image I've used is from Digi Stamp Boutique and I've coloured it with Prismacolor pencils. 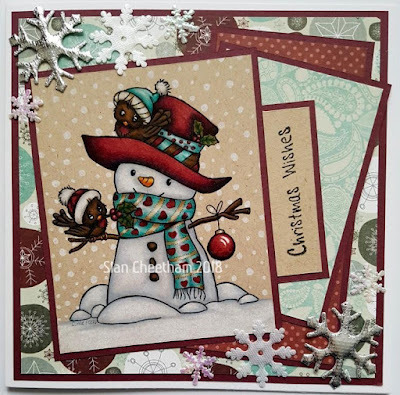 I layered my image onto patterned papers and added some wooden snowflakes. Hi everyone! It's time for a new challenge at The Alphabet Challenge. We're starting back at letter A this week, and A is for Animals. Since it's so close to Mother's Day, I decided to kill two birds with one stone and make a card for my mum. 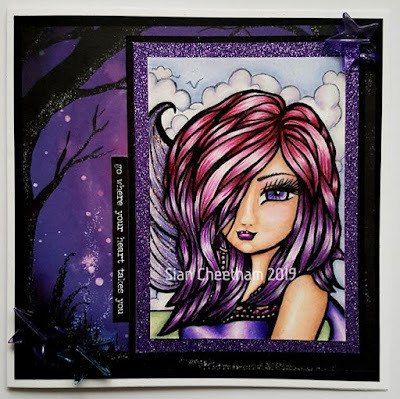 My image is a beautiful digi stamp by Di's Digi Stamps, and I've coloured it with Prismacolor pencils. I thought this was a lovely springlike image with the bird singing and the bee. I layered my image onto patterned papers and added some paper and fabric flowers. I hope you can join in the fun this week at The Alphabet Challenge. Hello again. This morning there's a new challenge at Cardz 4 Guyz. 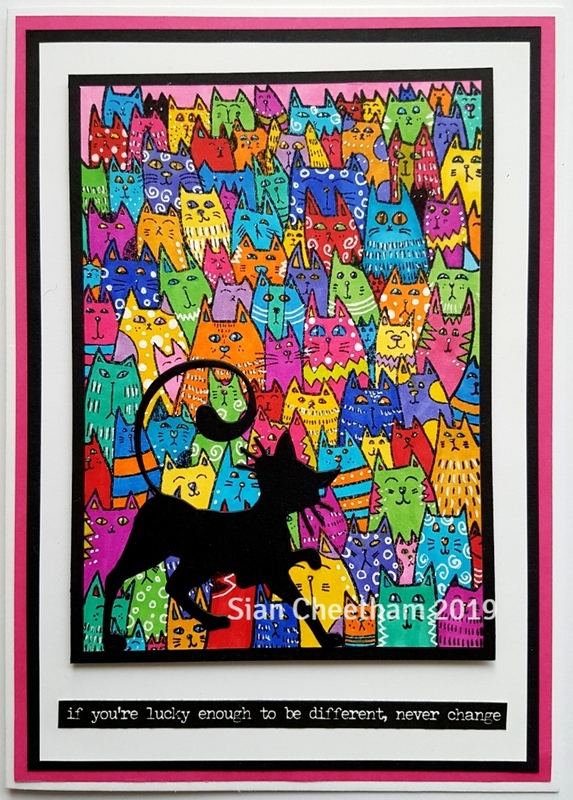 This week's theme is Get Messy - create your own messy background using paints, inks, stamping or pretty much anything else you can think of. 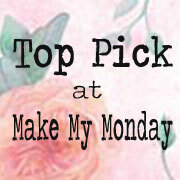 I created my background using a Gelli Plate and acrylic paints. 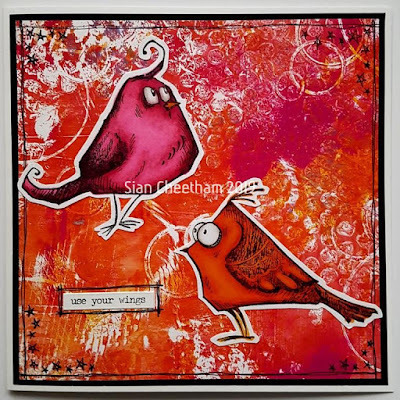 For anyone who hasn't used a Gelli Plate or similar, it's very easy to do and a lot of messy fun. You apply acrylic paints to the gel plate using a brayer and the press various textured items into the plate to take off soe of the paint. 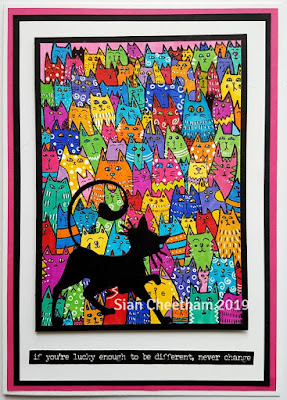 As you apply the acrylic paint thinly it dired quickly and you can apply multiple layers. I think I did two layers on this one, but I tend to just keep applying more layers until I have a look I'm happy with. The image I've used on my card is by Dr Digi, and I coloured him with Prismacolor pencils. The sentiment is from a Tim Holtz ideaology booklet. Good morning. A 'just for fun' card from me today. I made this one using a stamp by Indigo Blu and a die cut cat. I coloured the image with Promarkers and added a bit of white gel pen. I love the sentiment at the bottom, which is from a Tim Holtz Ideaology pad. Good morning. 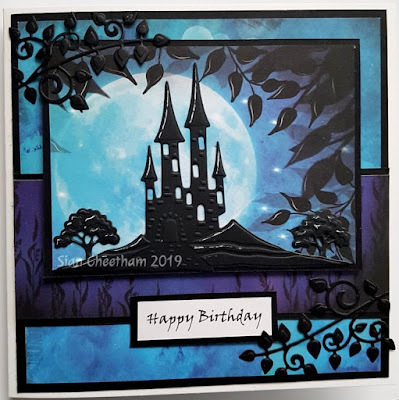 Today's challenge at Cardz 4 Guyz is to create something using die cuts. I've had this castle die for ages and hadn't got around to using it, so I thought this was a good opportunity. I layered my die cut image onto one of the Enchanted Forest papers by Crafter's Companion, which I think looks really effective. Then I used more of the papers for the rest of the card. 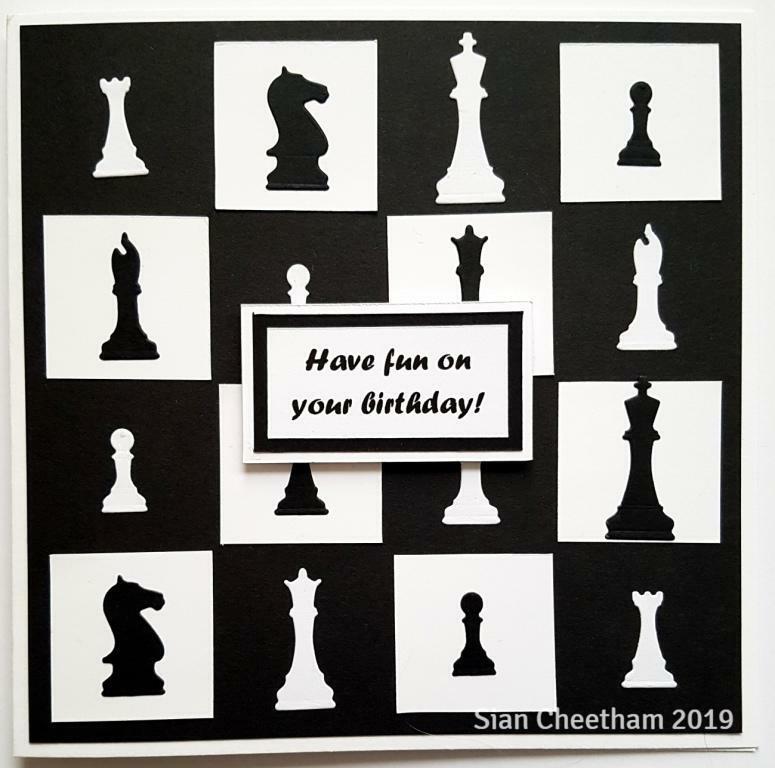 I added a "Happy Birthday" sentiment and then added some die cut leaves at the Corners. Good morning. It's time for a new Alphabet Challenge. This week's letter is Y, which is for Yarn (although you can also use string or twine if you would prefer). I used yarn flowers on my card. I used a tutorial which I found on Pinterest to make these, and adapted it a bit because I like to do things my way! 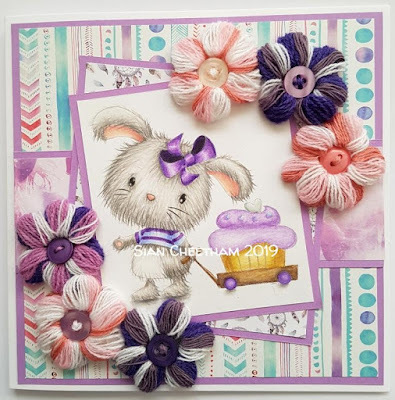 I used an image by Di's Digistamps for my card, which I coloured with Polychromos pencils. I layered the image onto patterned papers and then added my yarn flowers. I hope you can join in the fun at this week's Alphabet Challenge. Hello again. 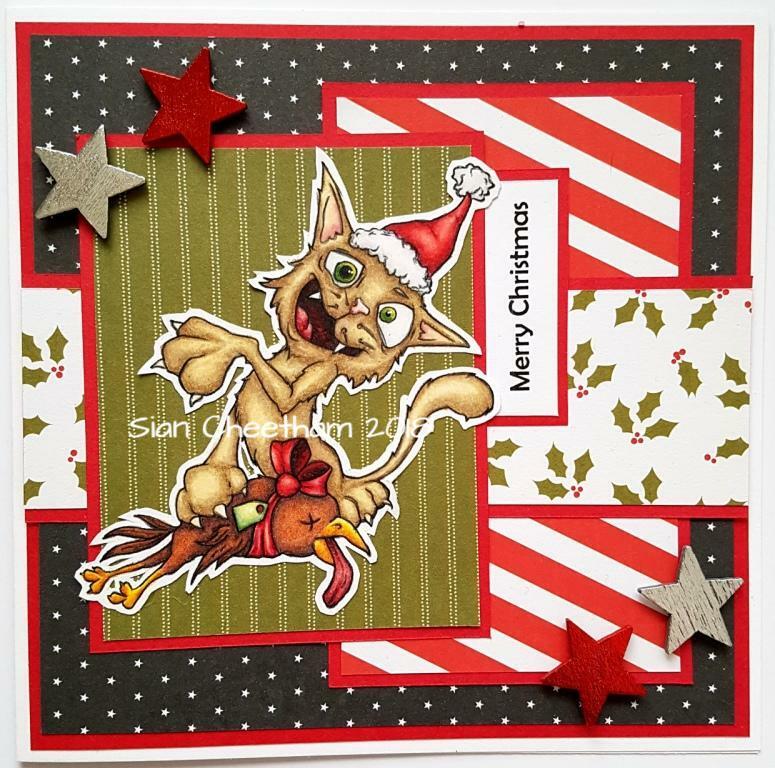 This week's challenge at Cardz 4 Guyz is CAS. 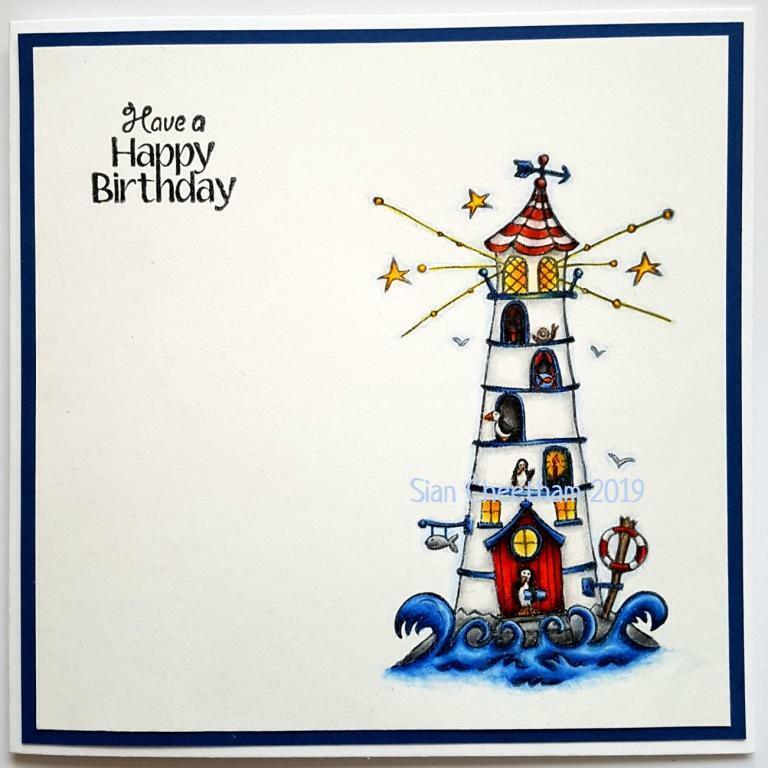 I've used this great lighthouse stamp by Stamposaurus, which I coloured with Polychromos pencils. 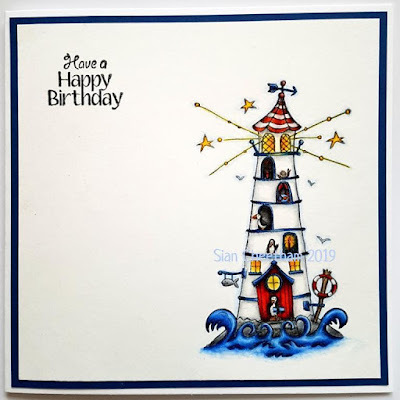 I layered onto navy blue card and added a stamped sentiment. Hi everyone. I've started early (VERY early) with my Christmas cards this year. 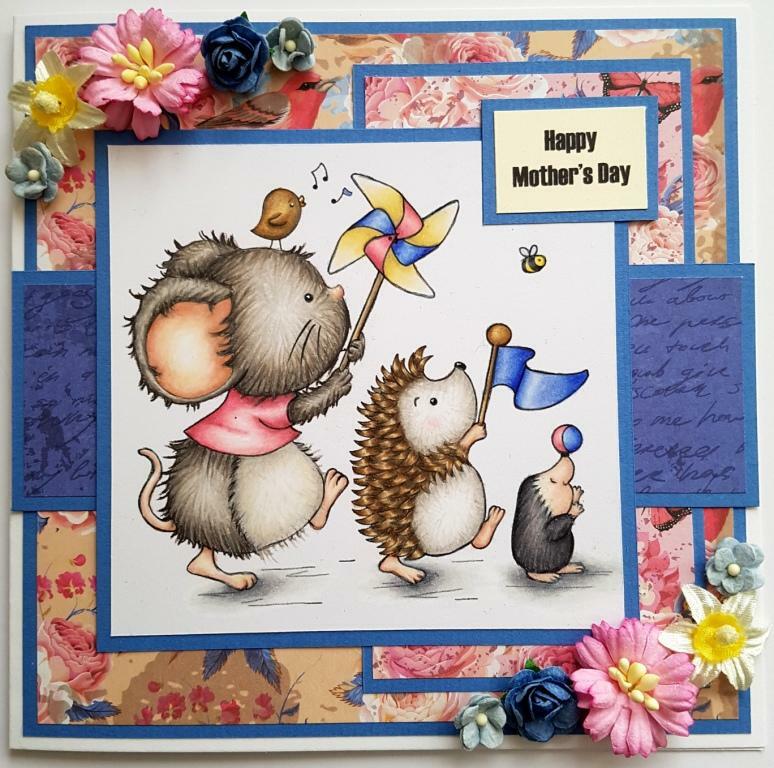 This one was made using an Image by Power Poppy which was one of the Kit and Clowder pencil classes. I coloured it using Prismacolor pencils. 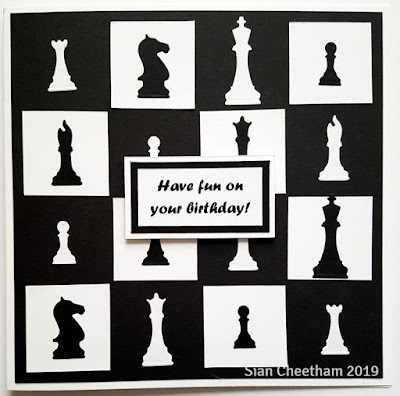 I cut around my image then layered it onto patterned papers. 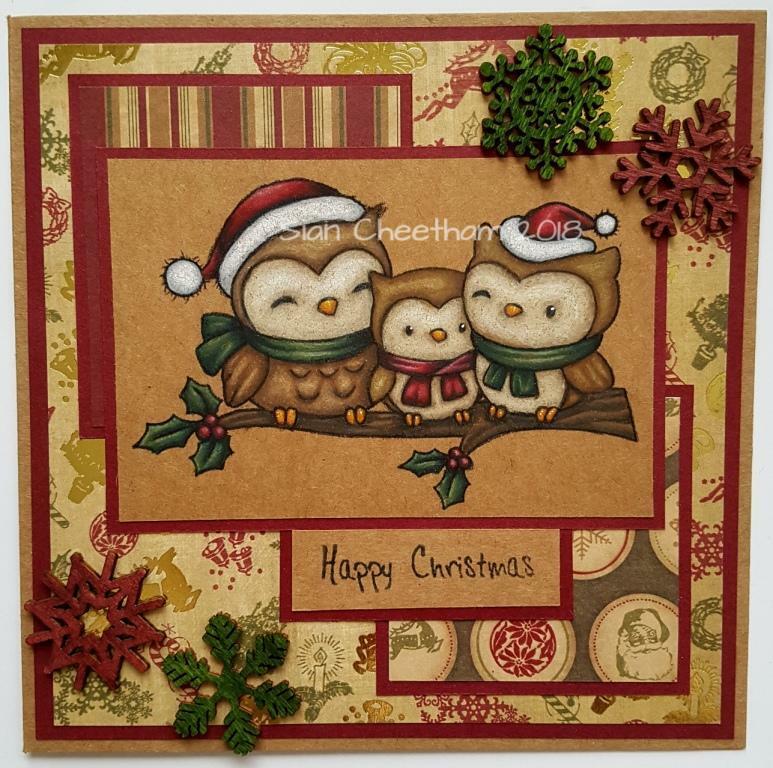 I added a wooden embellishment, the Happy Christmas sentiment and some red gems. I would like to enter my card in the Sparkles Christmas Challenge. Good morning. It's time for a new challenge at Cardz 4 Guyz. 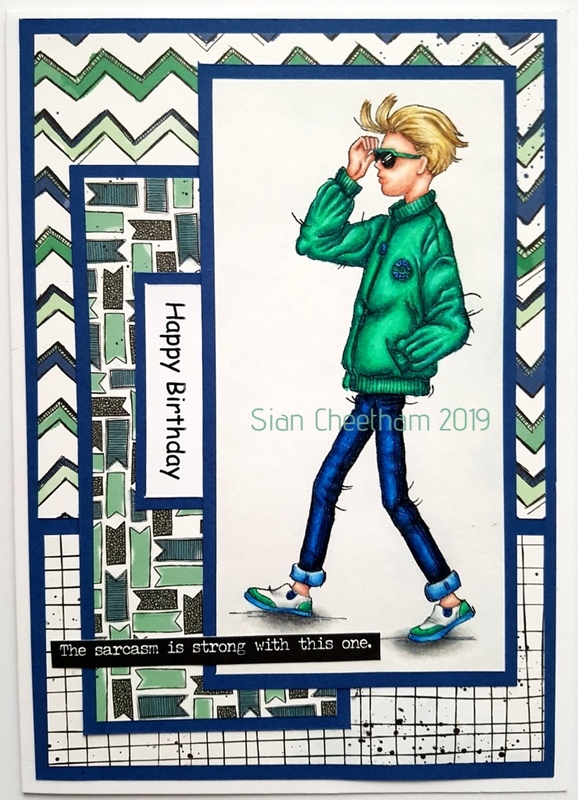 Today's challenge is to make a card using something beginning with T. My 'T' is a teenager, and I've created my card using a digital image by Lili of the Valley, which I coloured with Prismacolor pencils. The sentiment is from a Tim Holtz Ideaology book and reads "the sarcasm is strong in this one". I think I'm going to give this card to one of my sons for their next birthday. I haven't decided which one yet as they're both very sarcastic. I don't know where they get it from! 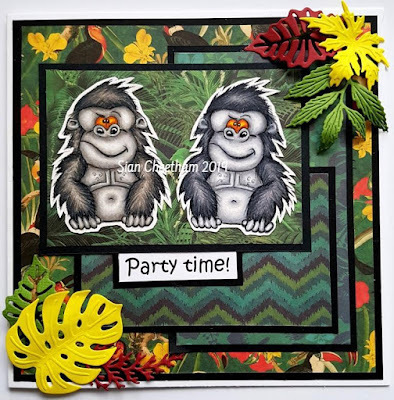 I hope you can join us for this week's challenge at Cardz 4 Guyz. Hi everyone. 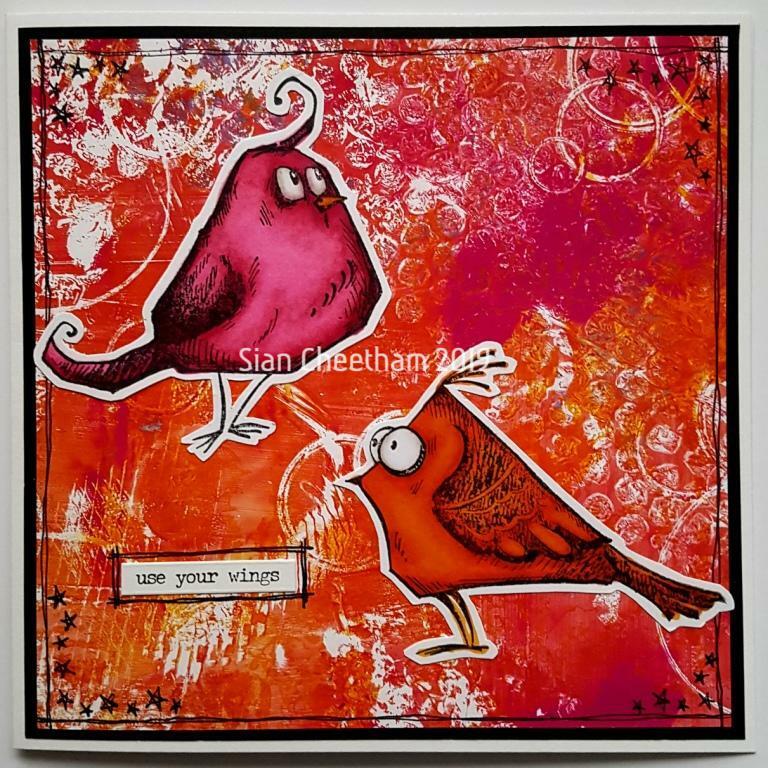 This is a card I made using a beautiful image by Hannah Lynn Art. I coloured her with Polychromos pencils. I normally do more layers on my cards, but I loved this image and also the patterned background paper by Crafter's Companion, so I decided to keep this simple. I layered my image onto glitter card and black card, with the patterned paper forming the background behind. The sentiment is from a Tim Holtz Ideaology pad. Good morning! It's time for Cards 4 Guyz' first challenge of the New Year. This week's challenge is Planes, Trains and/or automobiles (you can choose). For my card, I used a rubber stamp by Deep Red, which I coloured with Prismacolor pencils. 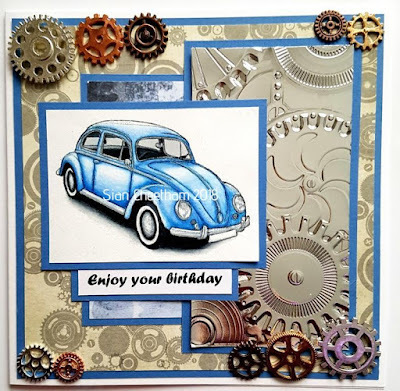 I layered my image onto pattered papers and an embossed panel made using a Tim Holtz 3D embossing folder, then added some metal cogs to finish it off. Good morning and Happy New Year! 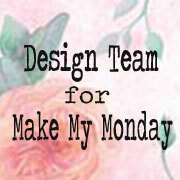 I am really excited today to be joining the design team for The Alphabet Challenge blog . This week's letter is U, which is for Use some stitching. The stitching on your card can be real or faux. I decided to hand stitch my card for this challenge. I used a cute image by LeAnn's World for this card, which I coloured using Prismacolor pencils. I die cut a circle around my image and hand stitched around the edges. I layered my image onto patterned papers and also hand stitched the edges of each paper that I used. 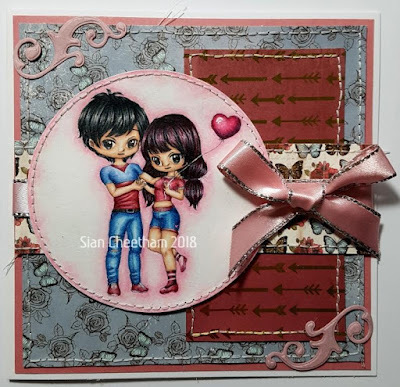 This took me absolutely ages, but it's a technique I love because I always like the way my finished card looks. I finished off my card with a ribbon bow and some die cut flourishes. Happy New Year everyone! I'm sharing one of my last cards from 2018. 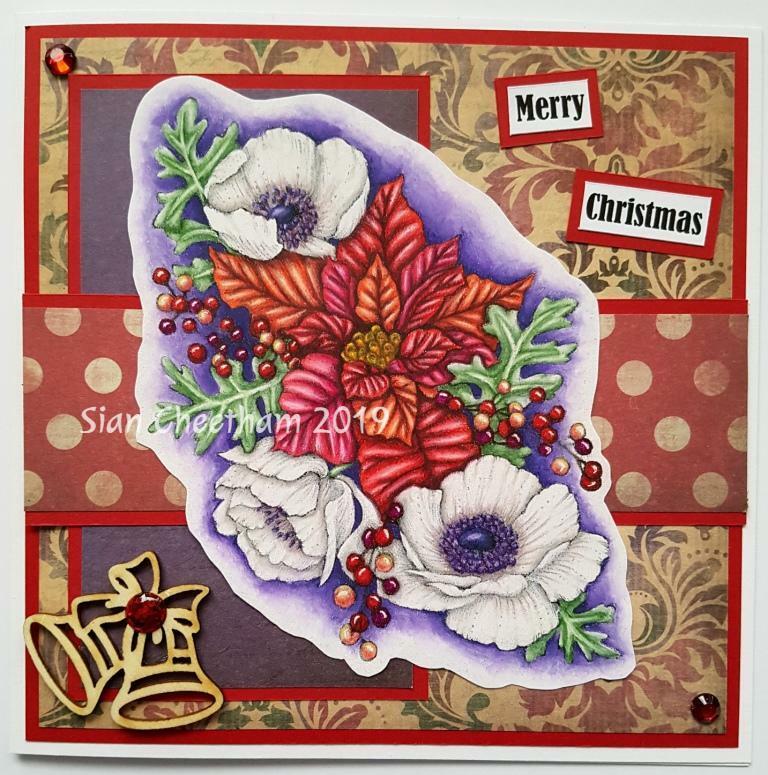 This one was made using an image by Bloobel Stamps, and coloured with Polychromos pencils. I wish you all well for the New Year, and will be back soon with some of my new creations. Hi all. This is another of the Christmas cards I made. This one was made using an image by Conie Fong, coloured with Prismacolor pencils. 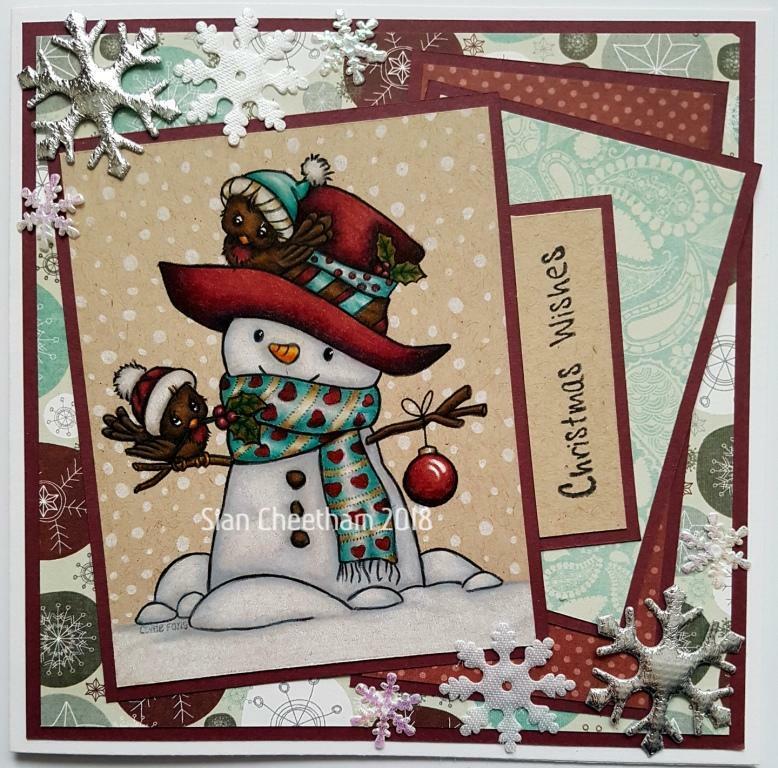 I layered my image onto patterned papers and added a stamped sentiment and some snowflake embellishments. I managed to make a few Christmas cards this year, although probably not as many as I would've liked. They should now have all been opened, so I'm safe to post pictures of them. This one was made using a digi stamp by Craftin Desert Divas. I printed it on kraft card and coloured it with Prismacolor pencils. 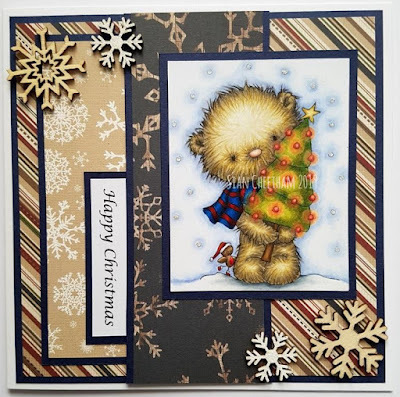 I layered my image onto patterned papers and added some wooden snowflake embellishments.